What a lot of projects on the go! 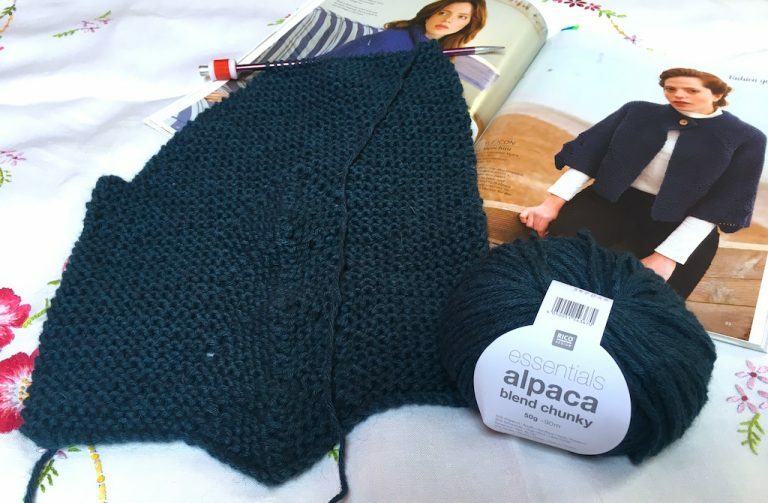 Projects on the go – another started! 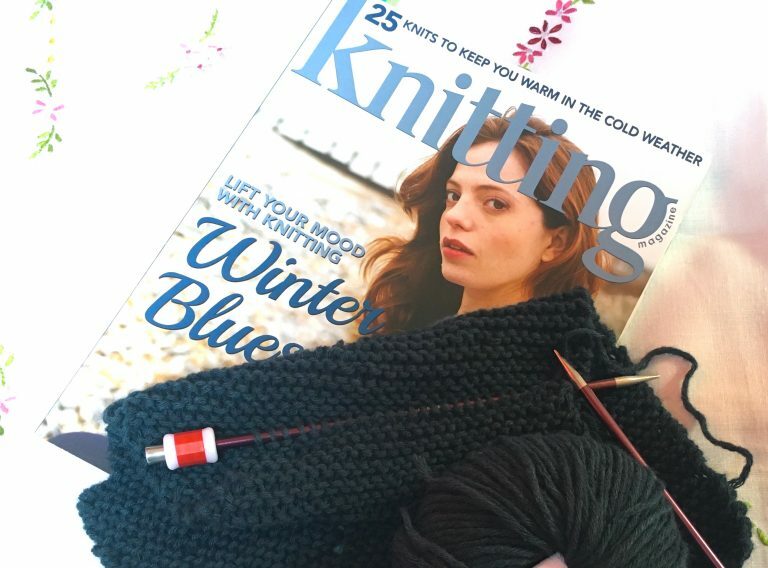 I may have lots of projects on the go, but I love leafing through knitting magazines and books. 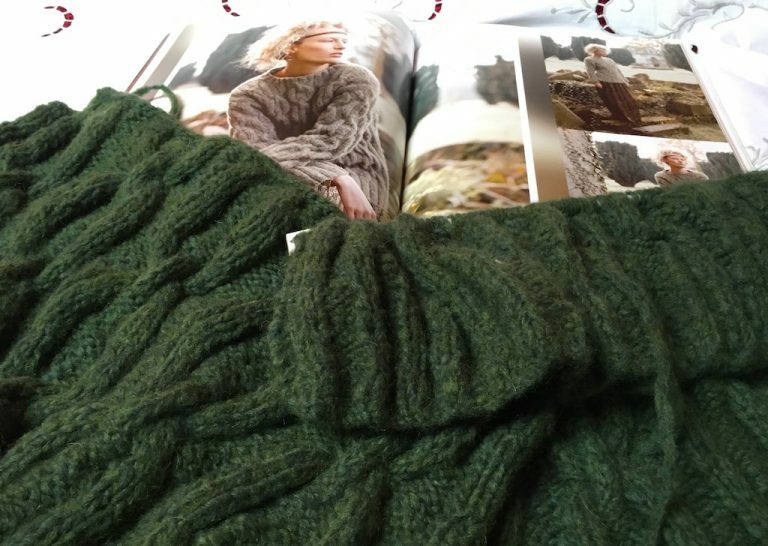 My wish list of all the garments that I’d like to knit myself is a mile long. I’d need to win the Lottery and have at least two lifetimes to complete everything on my list. Sometimes, though, it has to be done. 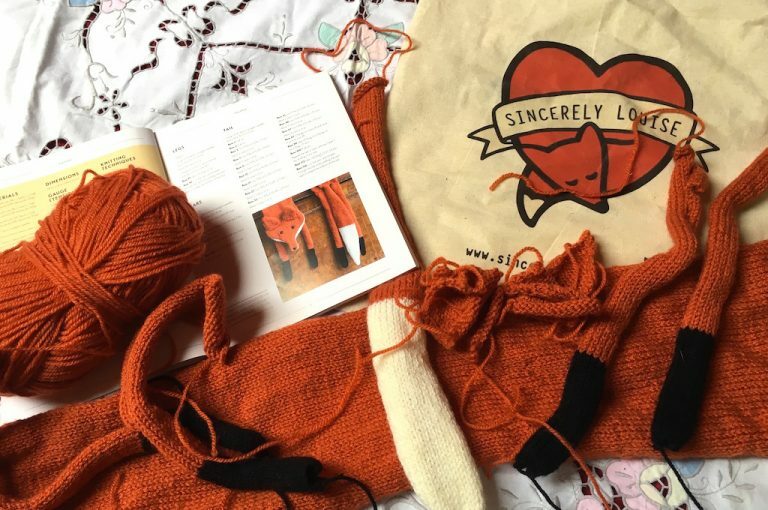 The yarn is ordered, there’s a day or two of anticipation, then that wonderful moment when the parcel arrives and you open it to see a fresh stash of yarn just waiting to worked into something magical. 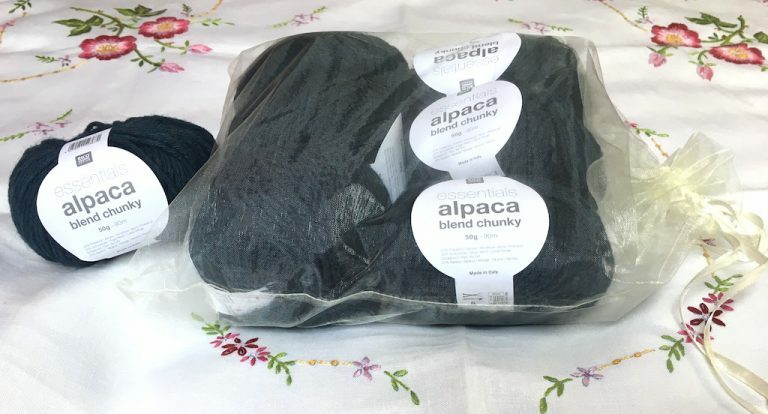 So it was the other day, when I ordered this Rico Alpaca Blend Chunky from Loveknitting.com. It arrived just two days later in a sweet gauze bag, together with a boiled sweet (which I couldn’t help but eat before I photographed the yarn!). What a lovely touch! 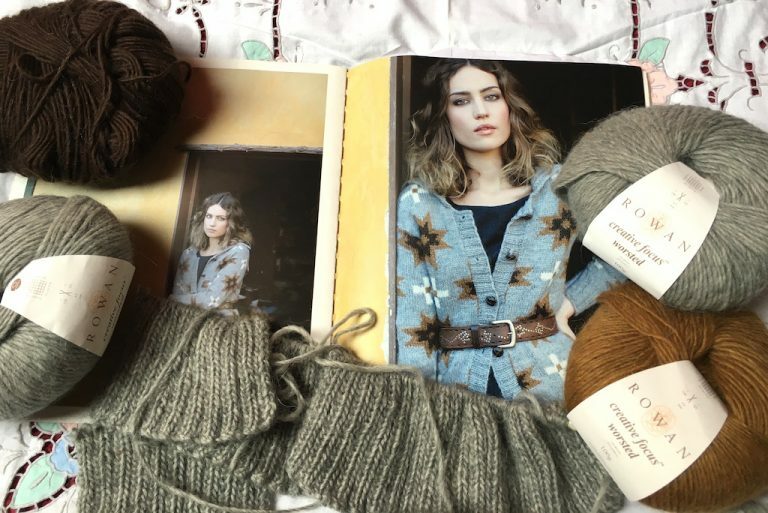 The yarn’s for a boxy jacket by Pat Menchini called Style Icon, which I’d had my eye on for autumn’s chilly days. I couldn’t help it but cast on straightaway and was soon well on my way with the right front. This is going to be so warm and snuggly. 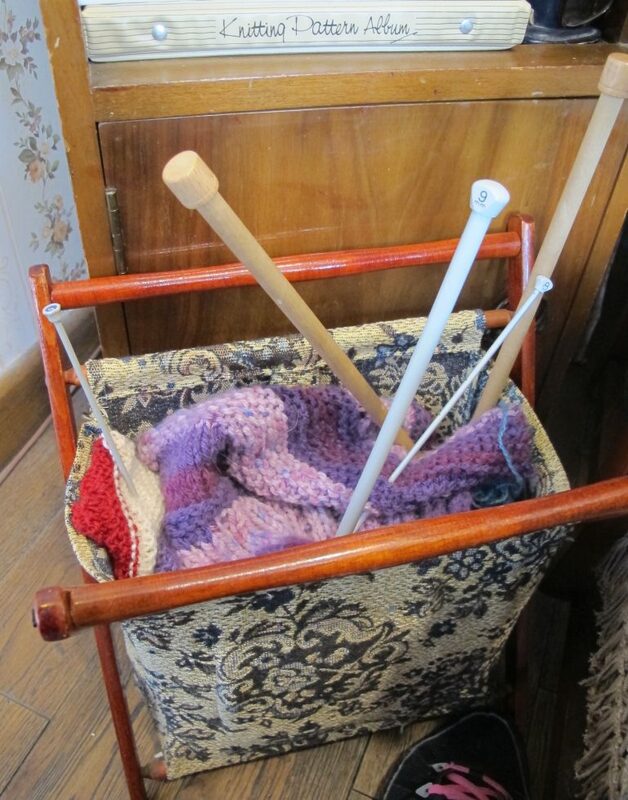 It’s made using Rowan Brushed Fleece, which knits up really quickly. It’s by one of my favourite designers, Martin Storey (who I’ve known since I was at college). 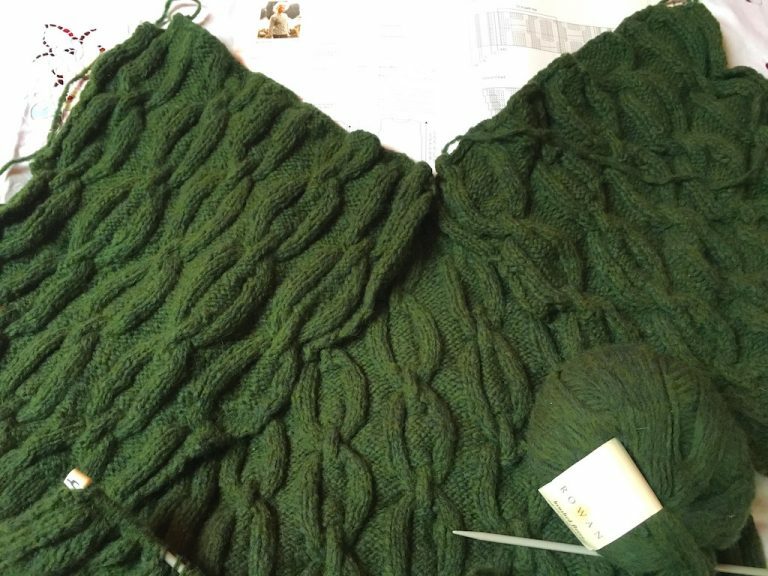 It has big cables that look like links and knits up quickly, so this should be a doddle to finish as I’ve already completed the sleeves, the back and some of the front. It’s taken from Rowan Magazine 58. 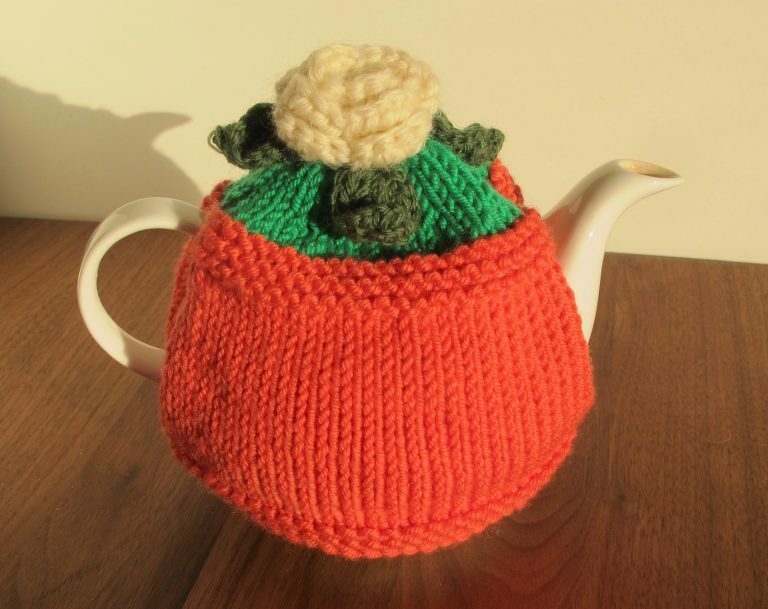 I’ve already got the yarn for the lovely scarf on the front on order too. It’s is going to be a birthday present for a friend. It’s another Martin Storey design called Windy Scarf in Pure Wool Worsted. 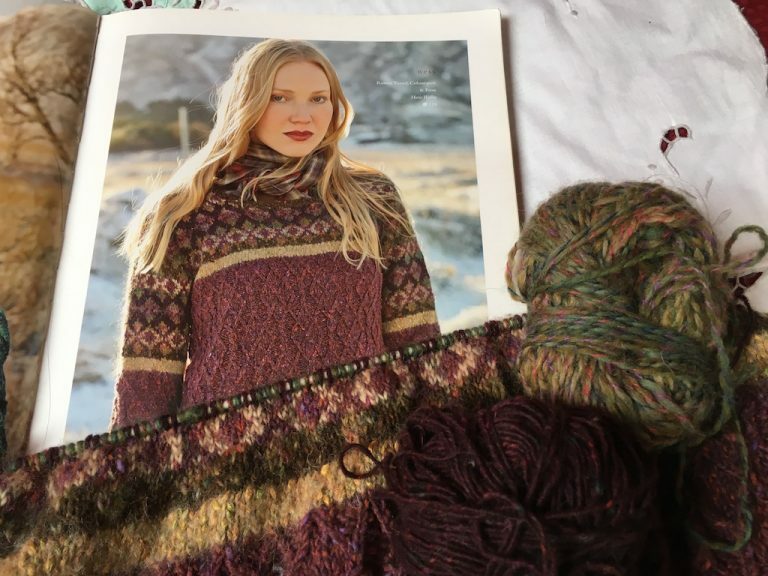 A beautiful autumn pattern from Marie Wallin, who always has lovely colour choices in her fairisle designs. 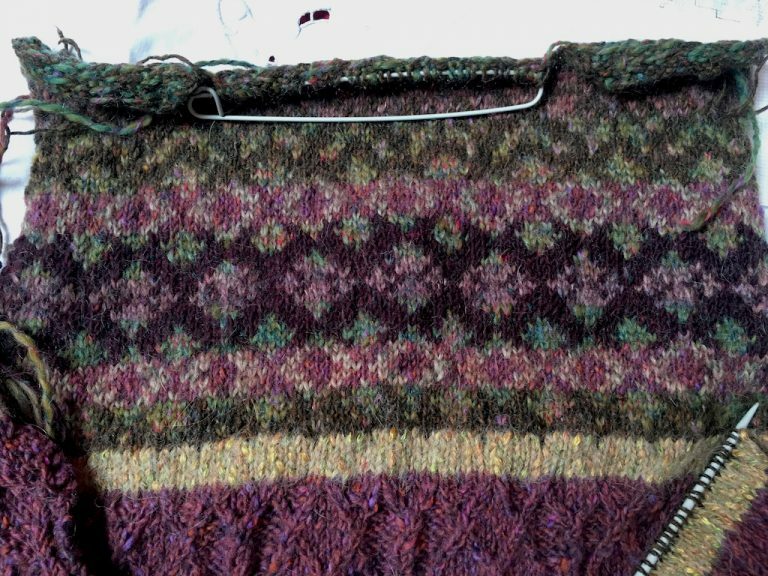 I’ve finished the back – here’s a close up of the fairisle pattern at the top. 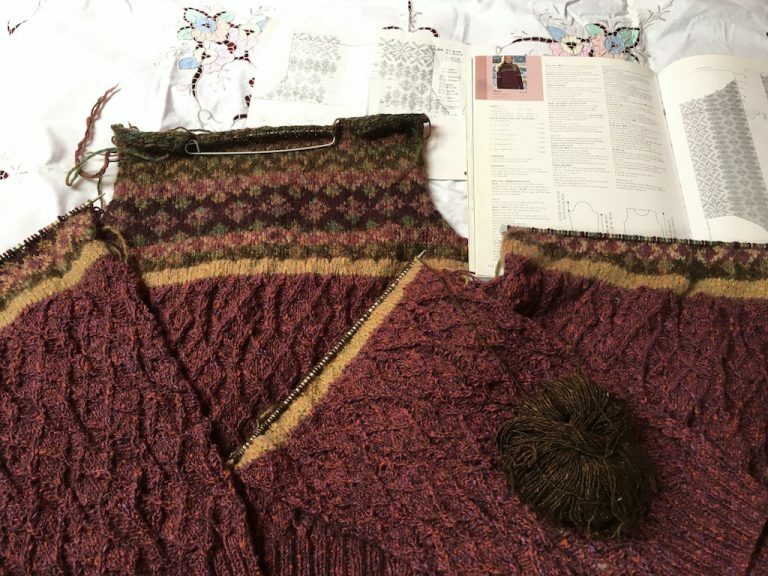 In fact, I’m well on the way to finishing this one, with the front worked as far as the armholes and both sleeves up to the fairisle too. It’ll be a on the blocking mat before you know it! 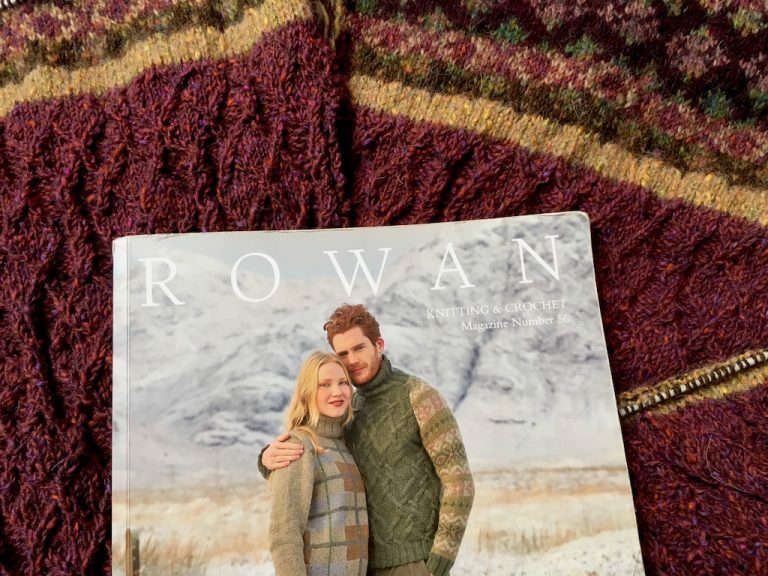 The Ness jumper is taken from Rowan Magazine Number 56. 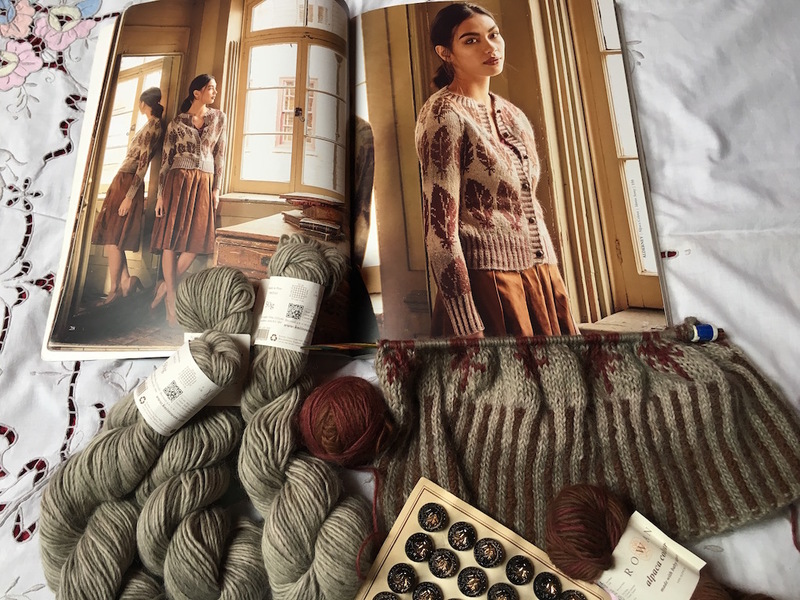 I’ve just finished Ordie (a Martin Storey design in Rowan Tweed) from the same publication and you can see the finished jumper on my Instagram page here. 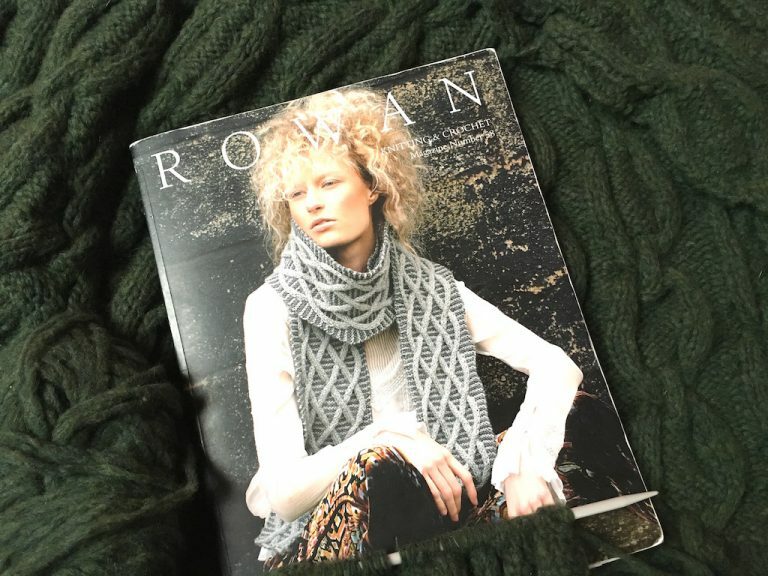 This cardigan, again designed by Martin Storey is from Rowan Magazine Number 58. 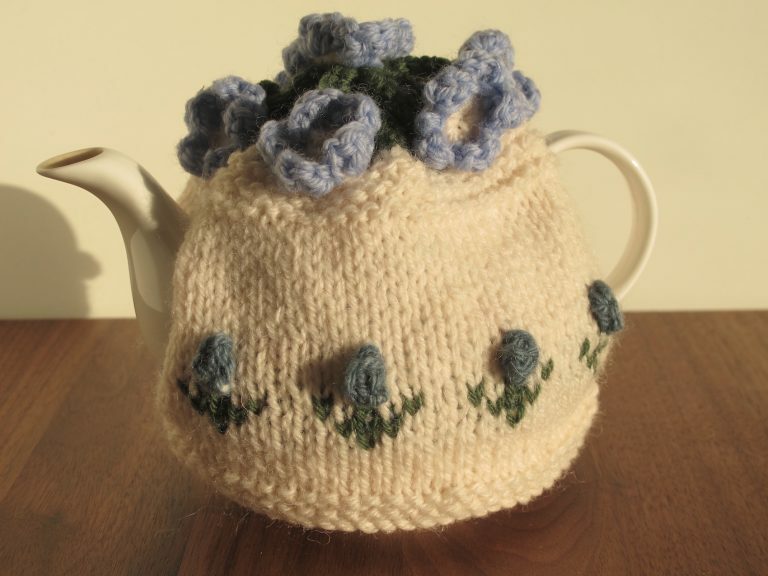 It’s made in Alpaca Colour, another Rowan yarn that seems to have been culled when the company was taken over, sadly. It’s really soft, and gently shaded, as you can see from this rib piece that I’ve already worked. 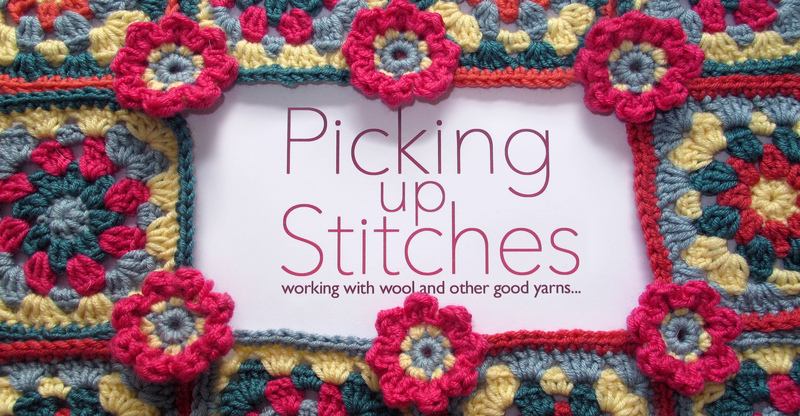 The pattern is, I think, going to be devilishly difficult to work without complete concentration, so maybe this will still be on the needles next year! 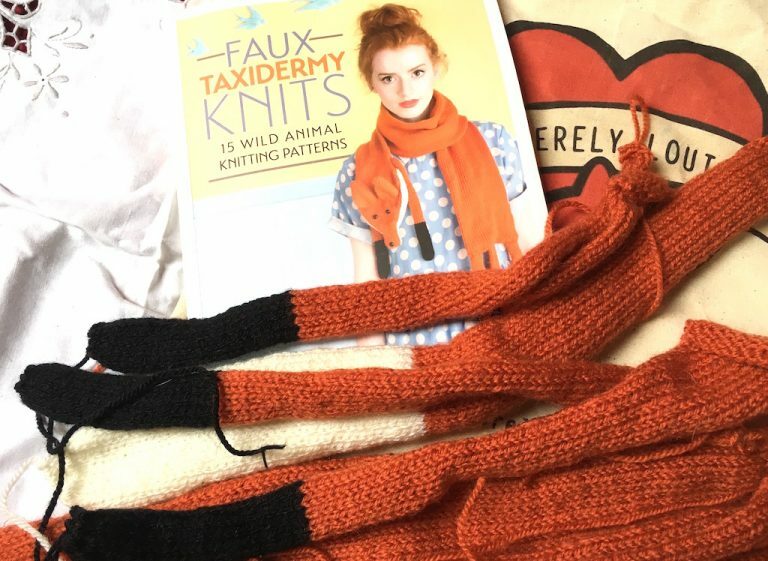 Now for something completely different… Sincerely Louise’s Faux Fox Stole caught my eye on her stall at last year’s Knitting & Stitching Show. I’d already seen here Faux Taxidermy heads on display at a local cafe, so I just had to buy the book. 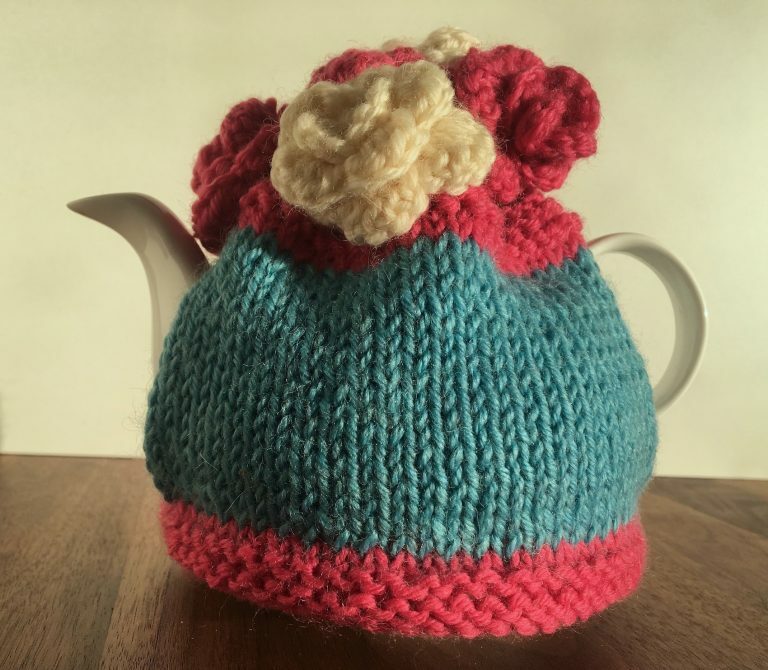 It’s a very simple knit that I find I can do with my eyes shut – I have been known to take it to the cinema with me and to knit while the film’s on! Finally, barely on my needles, is Quilt. This striking cardigan design from Martin Storey is taken from his fantastic collection Pioneer. 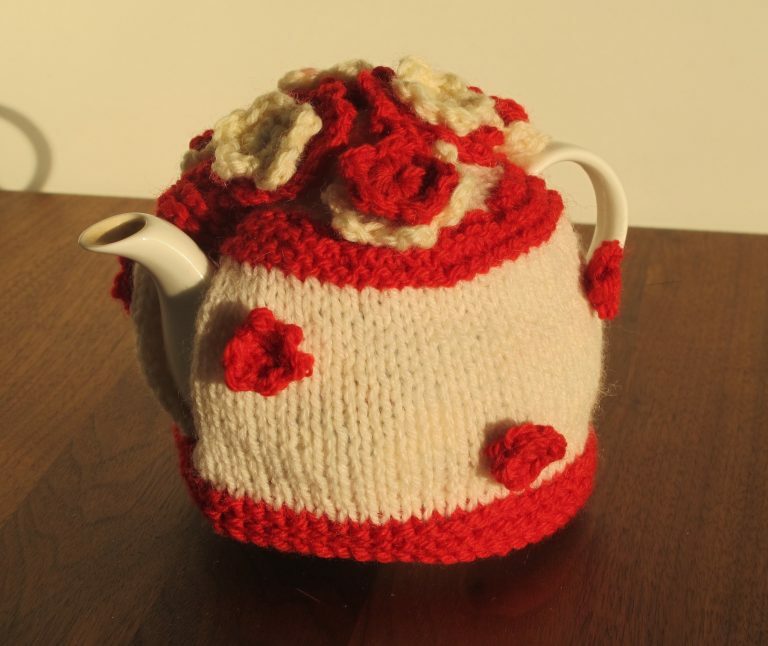 I’ve already knitted this in black, grey and cream for my partner David’s birthday a few years ago. At the end there were so many ends to darn in that this version went back in the knitting bag for a bit till I could face the darning again! I’ve made two other garments from this book: Wilderness jumper in Rowan Creative Focus Worsted for me and Frontiersman in Big Wool for David. I’ve definitely got my money’s worth from this publication. 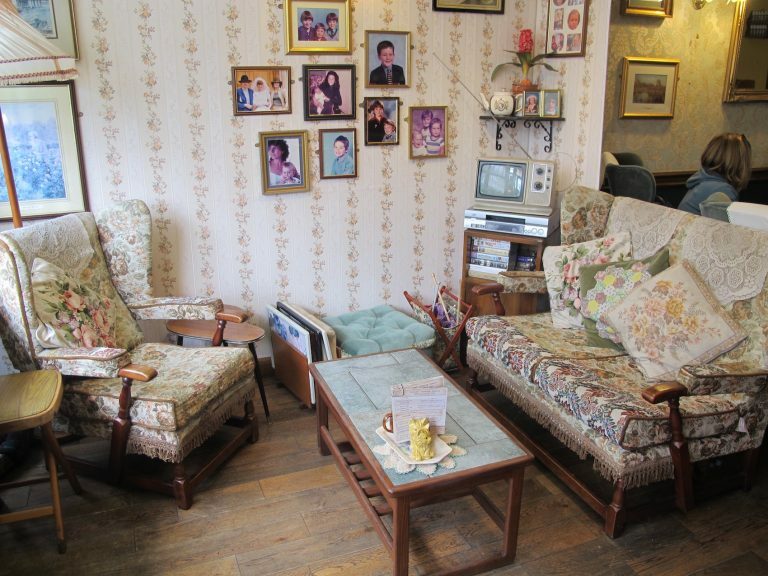 Tea cosies and vintage china spring to mind every time I think of Edith’s House cafe. 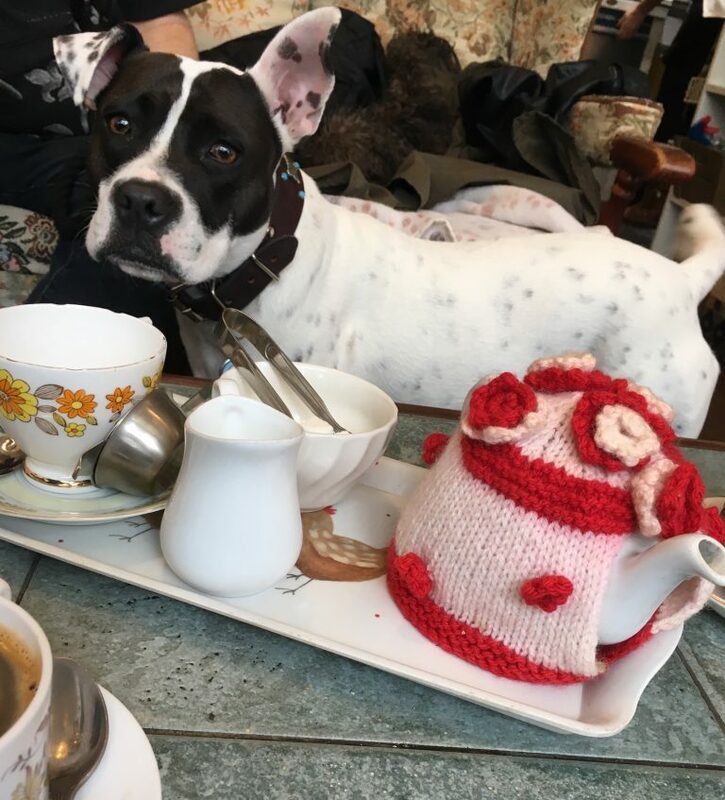 Ever since it opened up in Crouch End just over a year ago, I’ve always enjoyed popping in for a pot of tea, or a bowl of soup and a cheese scone, or (don’t tell anyone) a big slice of cake. 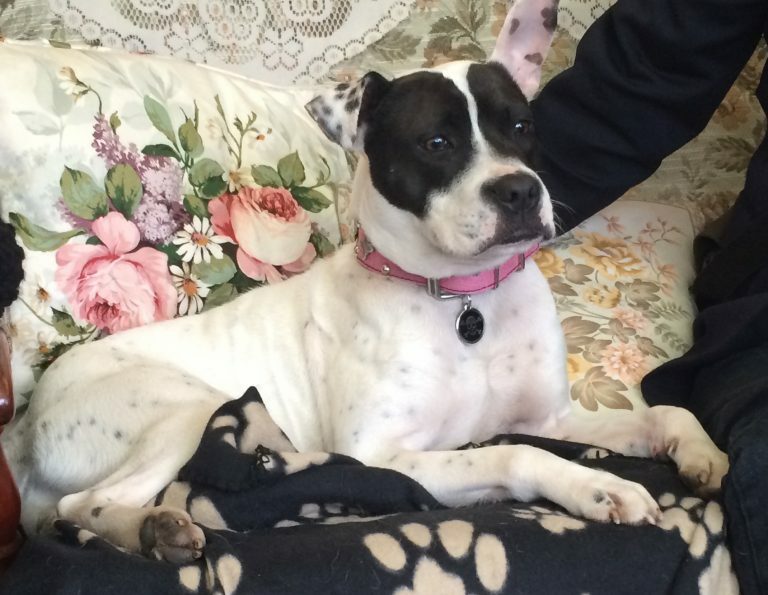 Lily, my dog loves it too – they provide special dog blankets for visiting pooches so they can sit comfortably on the couches. The cafe is a delight. Owners Eaton and Michael, who both used to be actors, have created a unique little eaterie. 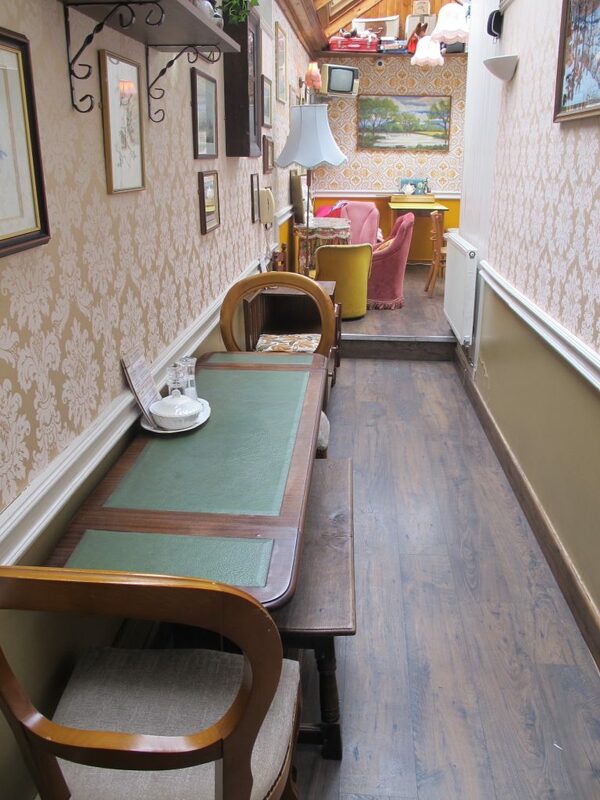 Each area of the cafe is set up as a different room from the past, modelled upon Eaton’s Nanna Edith’s house. 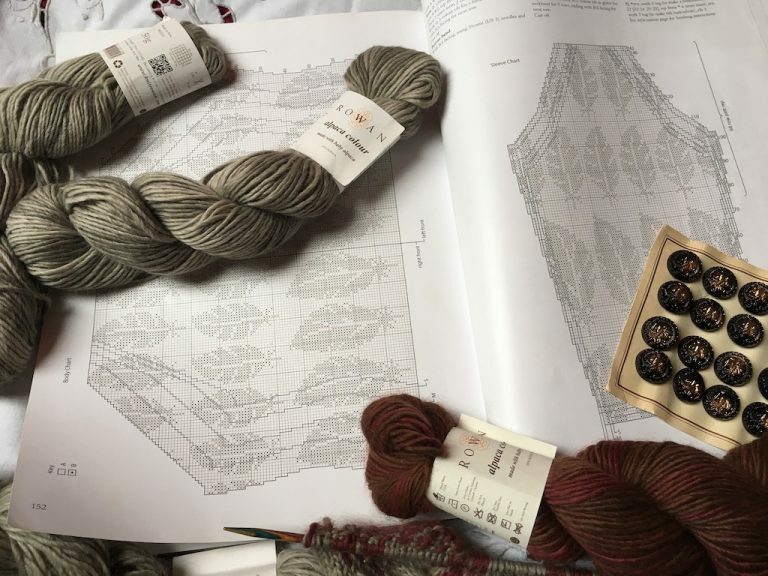 You can lounge in the living room – believe it or not, there’s even a knitting bag full of wool and needles if you fancy working a few rows, which I have done on a few occasions. 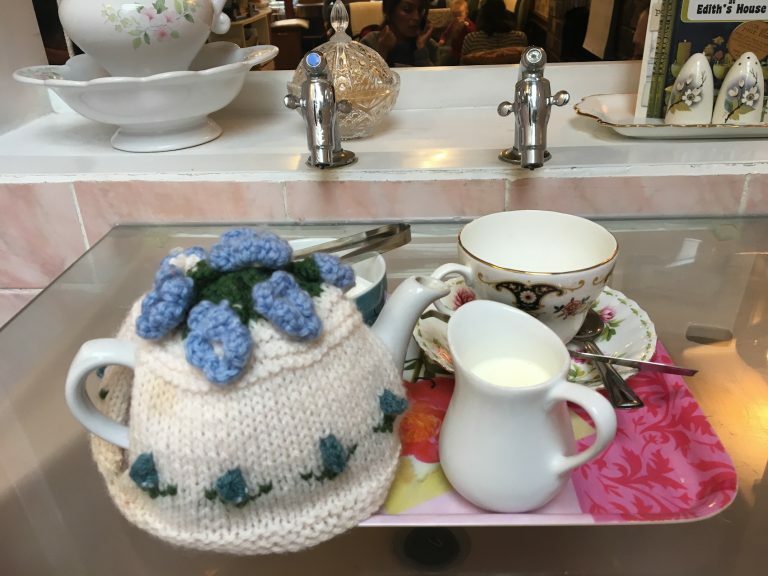 Or maybe you prefer to sit and sip in the scullery, or even have a tea sitting on the toilet balancing your tray on the washbasin (this seems the preferred photo stop for visitors to the area!). So if you could choose, I’d love to know where you’d sit! 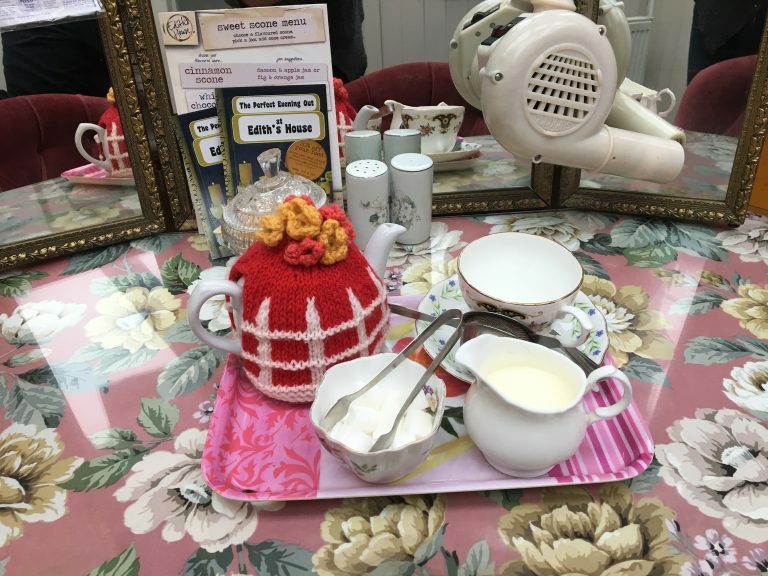 Most of the crockery is all old and mismatched and floral, with trays of sugar bowls and tongs, milk jugs and flowery teapots. 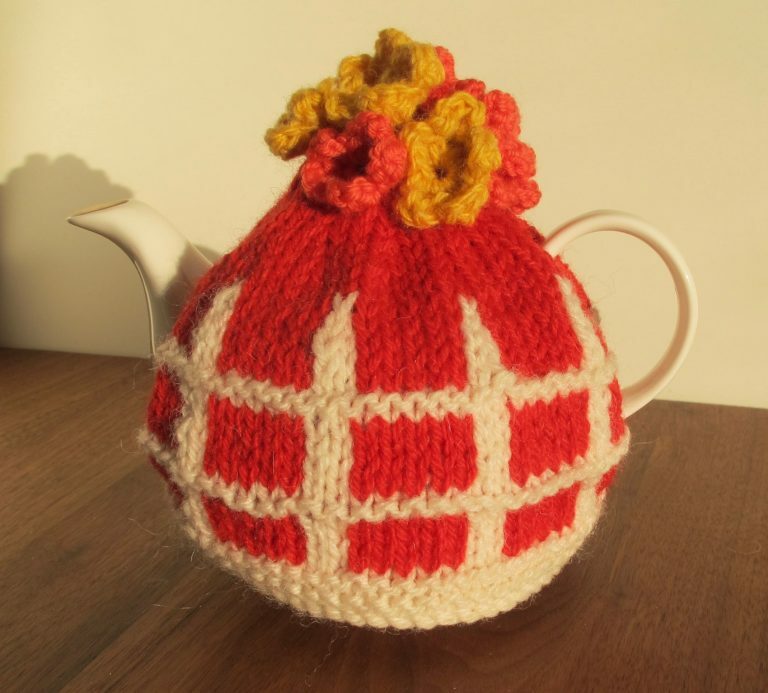 When Eaton told me they’d just bought some new white, single-cup teapots that needed little tea cosies and asked if I could design some for them, of course I jumped at the chance.